NOTE: The 12V Surface Pro charging cable NOT INCLUDED, if needed, please place separately order for this cable. USB port output 5V (Max 24W) for Compatible with Apple iPad iPhone iPod tablet and smartphone, support 5V USB C devices. 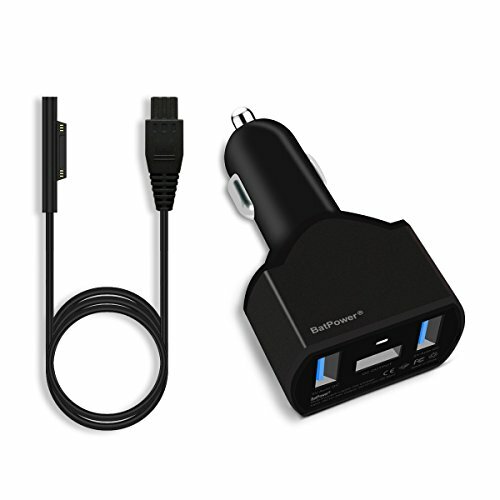 The BatPower 110W Dual USB Car Charger for Surface Laptop Notebook, Surface Book, Surface Pro 4 and Surface Pro 3, Replace for Microsoft 15V 4A 1706, 15V 2.58A 1800 or 12V 2.58A 1625 Charger Adapter. DC power output: 12V to 15V Max 110W for Surface Laptop, Surface Pro and Surface Book; Dual USB ports output 5V Max 24W for Apple Android tablet or smartphone, support 5V USB C devices. CCS Car Charger size: 2.3 inches (L) x 1.8 inches (W) x 1 inches (H) Weight: 3 ounces. Packing list: BatPower CCS 110W Car Charger Adapter, 15V Surface Book Pro Charging Cable (L=59 inches), AC Power Cord (L=4ft), Instructions Manual. (Note: if Sold by Euro, will be packed UK and EU Power Cords).